Dystopian stories’ main appeal comes from the fact that they depict a future in which the world is a lot different from today. The word “dystopia” is the antonym of the word “utopia,” which depicts a society that has perfect or nearly perfect qualities. Living in a utopia would mean to live in a perfect world. Living in a dystopia, however, means living under a certain kind of oppression, in a society where many things that we take for granted today, like free speech, movies and books, are either forbidden or contraband. But, that doesn’t mean that these are the only elements of dystopian stories. Such stories are still a branch of the futuristic science fiction genre, and as such, need to have a scientific background as well. Below, we’ve gathered some tips for writing dystopian novels that turn into masterpieces. The backdrop of your story has to be rich, detailed, and scientifically plausible. This requires a lot of research, especially if you’re depicting a not so distant future. You will need to research today’s cutting edge technology, social values, and study people’s behaviors. Then, think about how, when what’s considered a small possibility today, becomes everyday life, and how that technology will change the world, the social values of the people and their behavior towards the world they live in, and how that would affect their social interactions. While today, our society is far from perfect, the society in a dystopian world is worse. Totalitarian governments, rewriting history, and many other forms of supreme control over the population exist in almost every dystopian novel. When you create your own dystopian society, ensure that you write a timeline of the history of the future, in which you will depict detailed events that led to the state of the society that exists in the day and age of your novel. Every dystopian novel deals with a certain theme, a certain problem of today’s society that is exaggerated to great proportions, and serves as a warning. 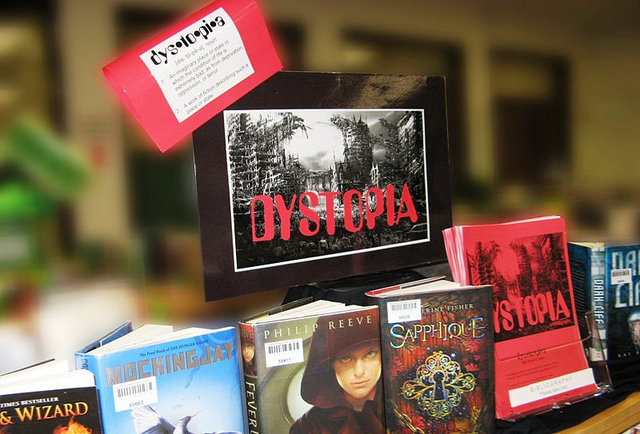 If you are writing a dystopian story, you need to choose the theme. For example, you have the exaggeration of entertainment television in the Hunger Games by Suzanne Collins, where the allure of reality TV is used to take the attention away from the realities of life of the people in the districts. Totalitarian governments, lack of water, lack of resources, climate changes, and dangerous technology represent a small number of possible themes you could explore for your story, and combining two, for example, lack of resources and climate changes, would create a powerful dystopian novel. Doing so would also serve as a warning to what we are doing to the Earth in this day and age. One of the best things about futuristic science fiction novels, part of which are the dystopian novels, is that the backdrop, or the backstory of the world you’ve created plays an important part in your story. The landscape, the people and the impending doom, whether it comes from natural disasters or it is caused by man, would put obstacles on the protagonist’s path, and maybe even threaten his or her life. The story depends on these factors as much as it depends on the protagonist’s actions and the consequences that follow said actions. The landscape, while it needs to be scientifically plausible and advanced, is also bleak, depressing and the dystopian society add up to a world that is desperate for change. And this is where your story comes in – the story of how that world is changed and becomes better. However, make sure you don’t make it too perfect, because that would turn your dystopian story into a fairy tale. The characters of your story need to be changed as well, but in a way that ensures that they have learned a valuable lesson, and are ready to embark on a new journey, where, while things aren’t perfect, they are ready to do anything to make them better. Image credit: Enokson on flickr and reproduced under Creative Commons 2.0[author] [author_image timthumb=’on’]http://writingtipsoasis.com/wp-content/uploads/2014/12/photo.jpg[/author_image] [author_info]Georgina Roy wants to live in a world filled with magic.